Four excellent Tankenӧtter (brainteaser) designs from 1985, now at the end of their run with Go! Games. Hello dear readers - I am very grateful once more, for the enormous effort that the Puzzlemad foreign correspondent, Mike Desilets has put into providing you with something to read to today! I have actually singularly failed to solve anything this week and am running out of stuff to write about. 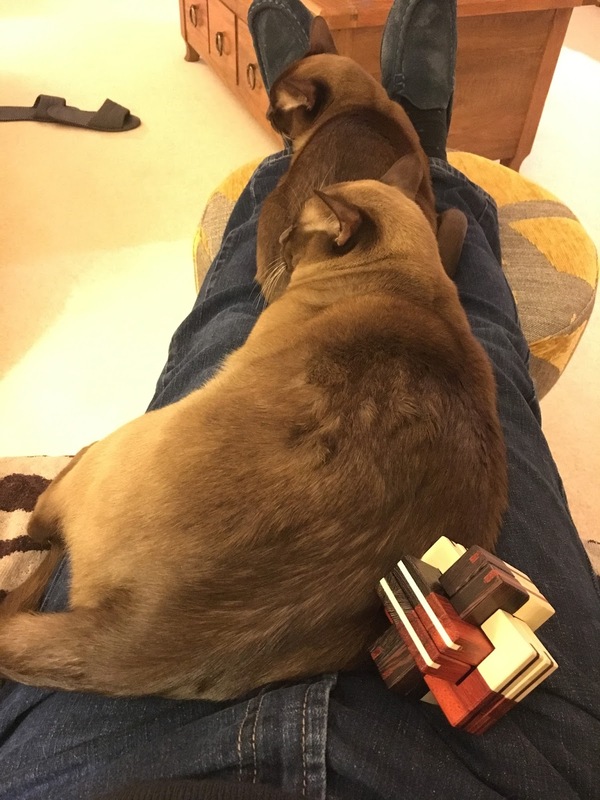 I also spent a wonderful day in Barnt Green yesterday courtesy of Allard and the other members of the MPP group where much hilarity was observed - I actually managed to play with some new puzzles and even solve some. But today I am knackered and am very lucky to have a post from Mike pre-prepared and only a bit of editing work for me to do. But they are destructive little buggers! In this very upbeat installment (as promised) I want to introduce, or perhaps reintroduce you to a few classic Erik Johansson entanglements. I’ve been meaning to write something on this set of puzzles for a while and am happy to have finally gotten around to it. These puzzles are attractive for a number of reasons, not the least of which is that they are very inexpensive. In addition to the very reasonable price tag, they are well constructed, visually pleasing, and enjoyable to solve. Erik Johansson’s Gärdsgården, 1984. Photo from http://www.tankenotter.se. A preponderance of the puzzles are of wire-string-bead construction with a nice mix of both novel and classic solution types. As with the above masterpieces, most of these are long-since out of production and probably very difficult to find. Those that are currently in production can be found here, as well as through other means, as I’ll explain at the end. 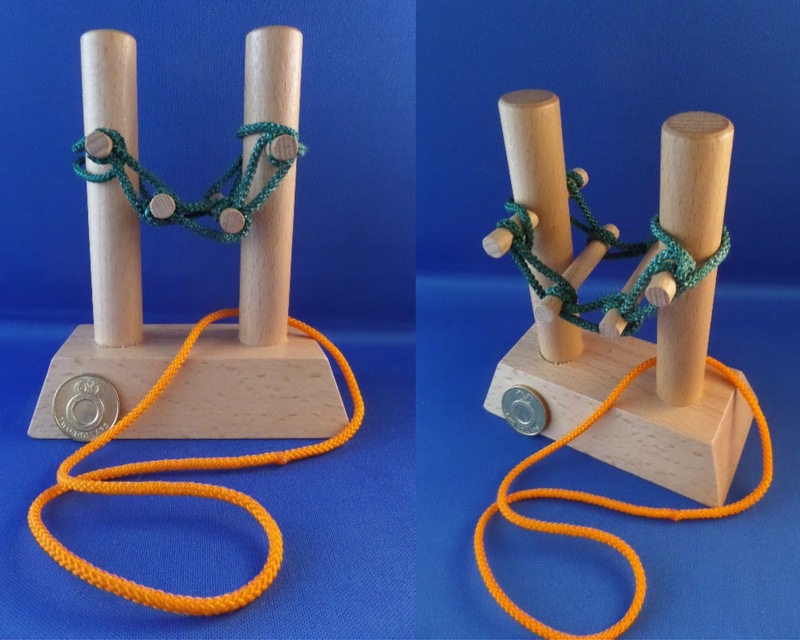 In addition to the wire and string, you’ll notice that Erik has also designed a number of puzzles utilizing self-standing wooden posts. I must admit that when I first came across my versions of these, I was not overly interested. 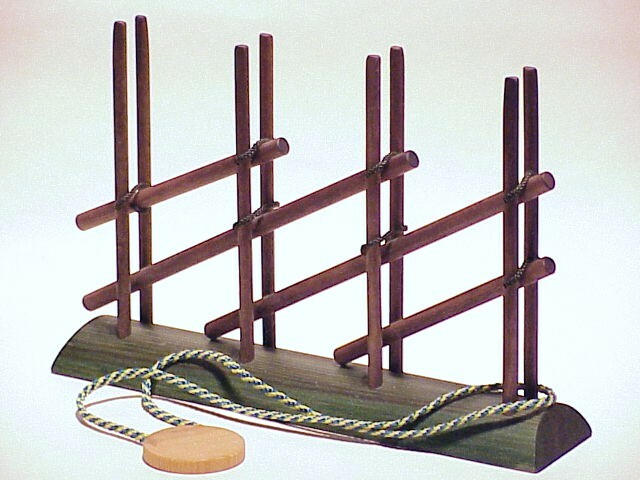 We are all familiar with the many wooden post-type puzzles available today, most of which represent endless repackaging of two or three basic puzzles. But luckily my puzzle buying compulsion overcame my disdain and I bought them anyway. I couldn’t be happier with the purchase. Most recent tankenӧtter from the mind of Erik Johansson. Left to right: Rope Ladder, Princess Heart, and Two Brothers. Now let’s get to the puzzles I actually know about. First up is Knopar, or as my box reads—“knots” (I like the Swedish better). Knopar resembles nothing so much as a very small Van de Graaff generator, but fear not, it will produce only mental sparks. This is the easiest of the four post-type puzzles I will talk about. Knopar consists of two posts and three rings, each of which has an attached length of string. 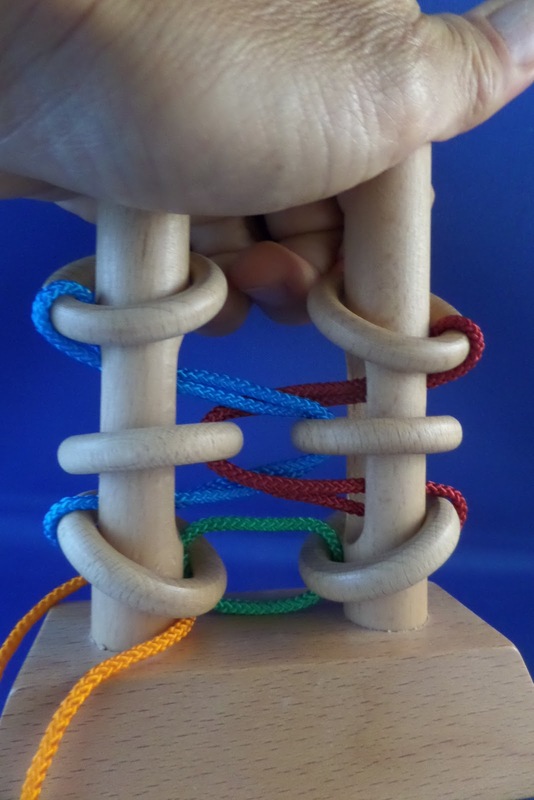 The puzzle is to disentangle the string such that each length is only attached to its parent ring. The solution, as you can clearly see, will involve removal of a few lark’s head knots. Many of you will recognize the structure. Today these are well known maneuvers, but I suspect they were quite novel when Knopar was first conceived in 1985. (Solomon Islands two-dollar coin for scale). This puzzle is not terribly difficult, although certainly not trivial either. Most experienced puzzlers will make short work of it. It’s a good morale builder. The packaging rates it as “medium” on a scale that runs from medium to difficult. That’s your basic puzzle marketing at work. I have it on good authority that puzzles labeled “easy” do not sell well. Consumers want to believe they will get a reasonable challenge for their money and buy accordingly. I understand that Hanayama cast puzzles of level 5 and 6 are overwhelmingly the best sellers (I don’t have a citation, but I swear I read that somewhere). Puzzle Master’s otherwise enigmatic 6–10 scale is probably another case in point. Who wants to buy a Level 1 puzzle? Not even my puzzle-challenged daughter would entertain a puzzle classed as Level 1. Well, regardless of marketing considerations, Knopar should be considered easy. But it should also be considered fun. For beginners it will take effort, but still won’t be a killer. If you are string-averse, please give this one a chance. It’s a good starter. Ringar. Solid mid-level disentanglement; labeled “hard” on the box. Next up is ringar (rings, of course). Ringar is a substantial step up in difficulty, but still quite manageable. 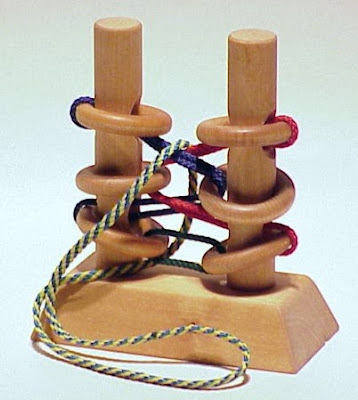 The puzzle consists of two large wood rings, one small wood ring, two lengths of string connected in various ways to the wood rings, and a pair of wood beads for good measure. These elements are attached to two posts, one of which has two longish slots, the other having only one. There is a metal ring at the base of each post and it is your job to remove them and then resecure them. Ringar has a pretty complex structure, but once you start manipulating, you’ll find that it can be progressively simplified. 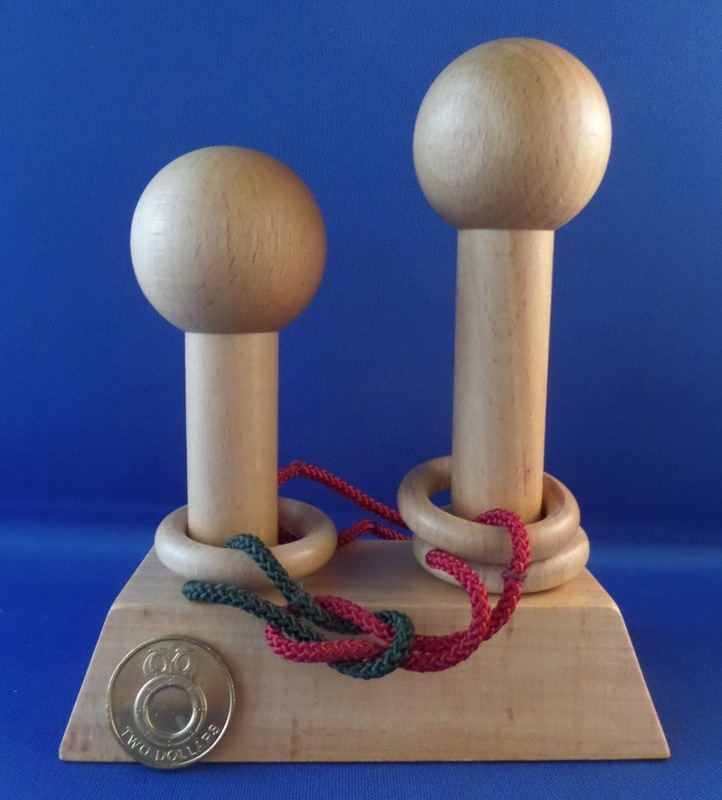 Although it bears a certain resemblance to the familiar Boomhower-type post puzzles and this family of movements obviously play a rôle - I consider it to be a new and innovative take. Getting progressively more difficult we have Hängbron or bridge. This is a truly fantastic puzzle. Here we are in the realm of, potentially, many many hours of puzzling enjoyment (I use the term loosely). I won’t bother describing Hängbron in any detail, just study the images above. It is archetypal Johannson. Well proportioned, vaguely nautical, and unlike anything else in your collection. Puzzle-wise, all you really need to know is that you are deep in N-ary territory, binary I believe (Ed I am sure Goetz will confirm or refute this as the world expert). 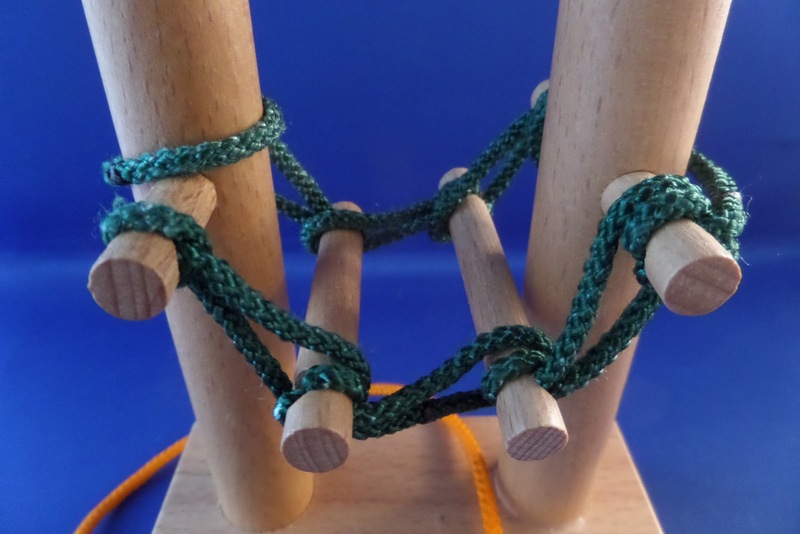 The object is to remove the loop of string that encircles the structure, and then of course replace it. Hängbron took me a couple weeks to solve, puzzling off and on, at about two hours a session. As Kevin has so rightly remarked in the past, it’s easy to get turned around with N-ary puzzles and I ended up reversing myself more than once. Like others of its breed, Hängbron lures you into a semi-hypnotic state. Your brain gradually slips into autopilot mode, at which point you are in grave danger. Even paying close attention, it was a struggle sometimes to understand my ‘direction’. The loopy string structure is perfectly calculated to misdirect. Also, be aware that Hängbron is not simply a new N-ary variant. It has a trick up its sleeve that can cause you an enormous amount of extra pointless work. Like the best of the N-arys, there is more to it than just systematic movement. That makes it a very satisfying puzzle, and one to be proud of once you master. Hängbron gets my highest rating on all counts. Finally, we have Politiken, or politics. This puzzle also gets my highest rating. 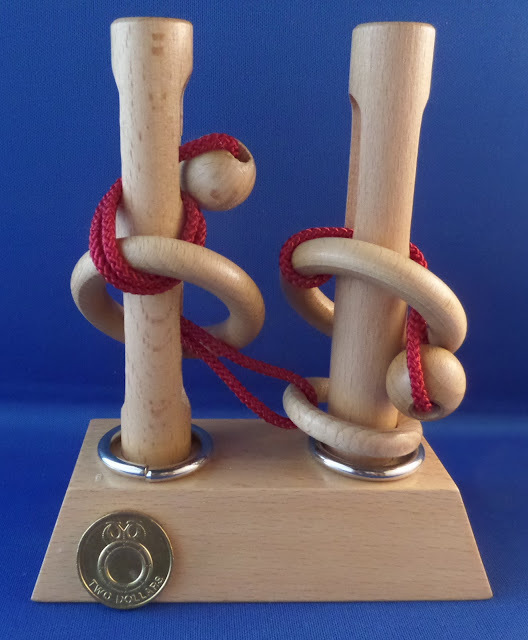 Again, it’s an attractive Beech-wood puzzle with nice polygonal base and two posts. 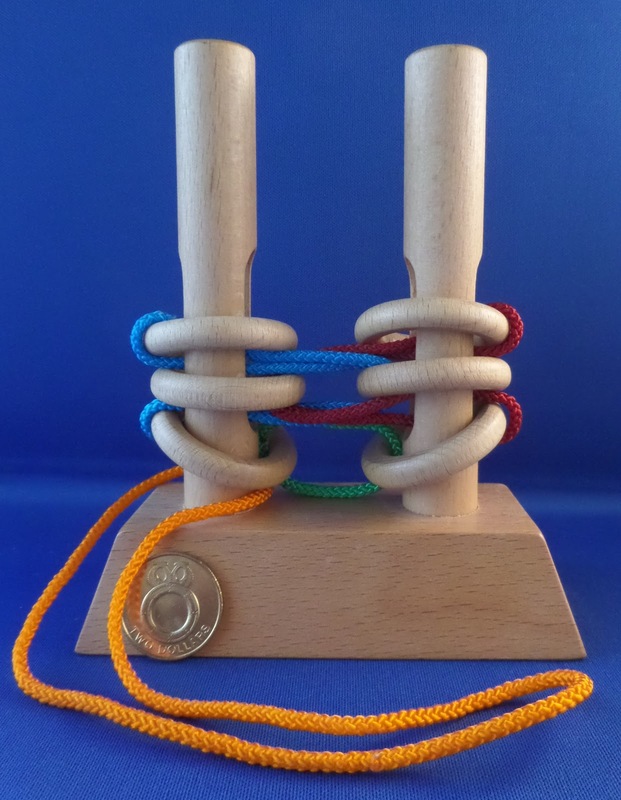 In this case, the posts support six wood rings which are interlaced with three nicely colored loops of string. A fourth string encircles the base, running between the posts, and this must be removed (and then replaced). Although I love the puzzle I have, it is worth noting that the commercial version deviates in one critical manner from the original, as shown at Tankenӧtter. The original design utilized four round holes in the posts, as opposed to the long slits used in my version. The holes look like they hold the rings, and thereby the strings, up and apart. This gives the puzzle an overall different stance. Aesthetically, I think the original is easier on the eyes. Puzzle-wise, however, I think the long slits enhance the difficulty. The long slits provide you with access to all the rings and strings, in any manner you wish to attack them. This can be very confusing. The original hole set-up, I think, provides more guidance. That’s just my opinion from looking at them. Original Politiken design. Rings and strings tauter and better proportioned overall. Make no mistake, Politiken is not an easy puzzle. This one will tax you. The ultimate solution is not extremely complex, but there are so many ways to go wrong. I, for one, could not manage to analyze the structure in my head. Like with Hängbron, you have to Think© as you work. Equal parts exploration and cogitation. If you do that, you will be rewarded with an exceptional a-ha! moment. Very pleasurable. As a set of puzzles, I think these four Tankenӧtter make an excellent set. Each represents a different class of entanglement problem and they are, for the most part, quite distinct from other post and string entanglements on the market. Difficulty level progresses nicely up the range. If you are an entanglement enthusiast, or just want to add some novel Johansson designs to your collection, you need to pick these up. You really can’t go wrong. They are very reasonably priced. My puzzles were actually extremely cheap, and yours may be too. These puzzles are marketed in the states under the rather undignified brand name “Noggin Noodlers.” They were produced, exclusively it seems, for Go! Games. Go! is somehow part of the Calendars.com enterprise and can be found at your local shopping mall in the US during the holidays. Every year, right about this time, Go! franchisees open shop for the holiday season (and then close promptly when it is over). Many of you know just what I am talking about. I purchased my first puzzle several years ago. I was in a dusty box, clearly very old stock. I didn’t figure out exactly what it was until much later. Normal price for one of the above puzzles is about $15US, but I purchased a few this summer in the Northeast for half that. Many stores are trying to get these items off the shelf to make way for new items, so you just might get a deal. As far as I can tell, the Noggin Noodler line is no longer being produced and sellers are just moving the last of the old stock. The whole line, which includes a half dozen puzzles I haven’t described, is comprised exclusively of Johansson puzzles. If you can’t get one at a Go! store just keep an eye on Ebay and you’ll eventually find one. There should be many thousands of them around. If you’re patient, you’ll probably find one at your local thrift shop. In my puzzle shopping and general internet exploration I’ve come across some very similar post puzzles—Johansson designs—in the Mi Toys line. These are single post puzzles, but some clearly exploit solutions found in the above two-post puzzles. 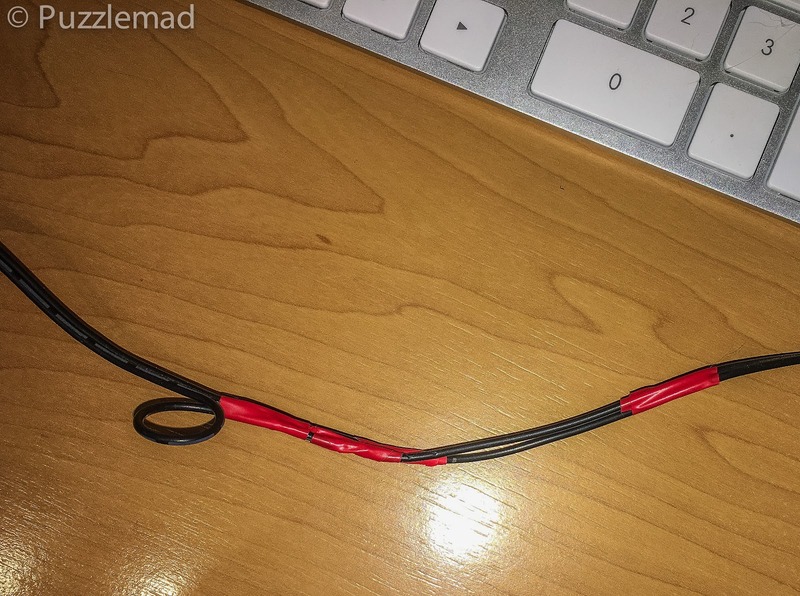 I’m not sure if Mi Toys was involved in the manufacture of the Noggin Noodler line (both are Chinese-made), or whether there is some third party that produces for both Mi Toys and Go! Other Johansson puzzles are also out and about. If you study the Tankenӧtter website closely and get a feel for the style, you’ll start to recognize them everywhere, but curiously you will never see any attribution to the designer. Puzzlemaster carries more than a few here and here. Rob Stegman shows a bunch over here that were sold under the Mad Cow and Stirling Fox names. Mad Cow looks like they are still active. I can’t think of an entanglement specialist who has had such a diversity of items go into production on this scale. I sincerely hope he is getting compensated! But I do really wonder how many producers bother with licensing his designs, especially internationally. Only Erik and his lawyer know. For my own part, I am very happy to have stumbled across these Tankenӧtter. Don’t be misled by the cheap price and silly brand name, these are well-made puzzles that deserve your full attention. Thank you so much for such an interesting and informative post Mike. Your descriptions have certainly whetted my appetite for these puzzles and if anyone should come across them then please let me know. Maybe you can buy them and ship them to me or if they deal internationally then maybe I can buy myself.